Question of the week: I just updated my avast to version 8. The new look is great! There’s a feature called Software Updater that looks interesting. How do I use it? Great question, and thanks for the compliment on avast! 8’s new look. To answer your question about the new avast! 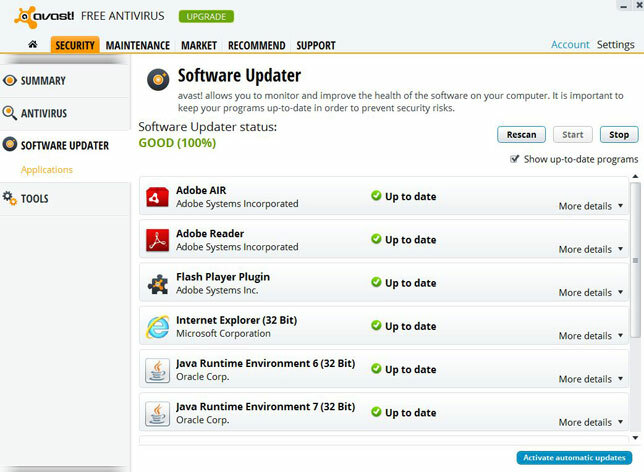 Software Updater, let me set the stage for you so you will understand why Software Updater is so useful for most users. You are a busy person juggling family and work, maybe even taking a few classes. You use your personal computer to pay bills, learn how to fix a leaky faucet, and email your child’s teacher. You are concerned with online security, but there are only so many hours in the day, right? You heard about the latest Java exploit, but you’re not sure what it is, how to fix it, or if you even need it. Here’s some advice from Oracle, “In order to protect themselves, desktop users should only allow the execution of applets when they expect such applets and trust their origin.” Um…what? And wasn’t there something about an Adobe Flash Player vulnerability? Adobe says, “Users of Adobe Flash Player 11.5.502.135 and earlier versions for Windows should update to Adobe Flash Player 11.5.502.146.” Um, OK…which version do I have? Where do I find it? HELP!! When it comes to your computer’s security, you can be guaranteed that this or that exploit, vulnerability or hack is taking place. How can a normal person be expected to stay on top of it all? You can’t, and that’s where avast! can help. One of the primary ways that malware spreads is by exploiting known security issues in commonly used software. When your software is kept up to date, most malware will be unable to spread! Busy people don’t have time to stay on top of every software update, so that’s why we added Software Updater in all four avast! 8 versions. You can resolve any issues by just clicking the “Fix Now” button. The available updates will then be downloaded and your software can be updated. 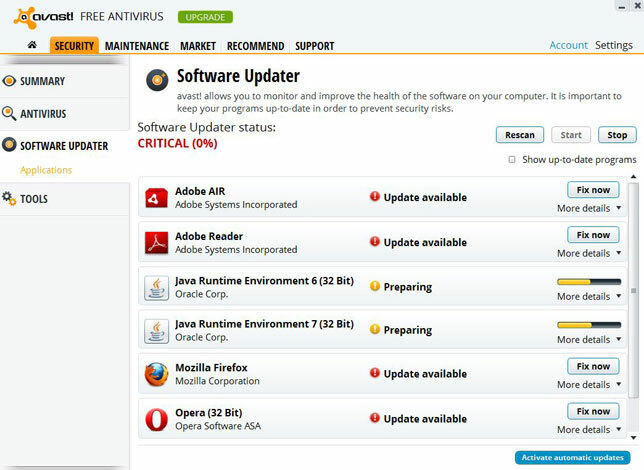 Once all updates are installed, your Software Updater status will be shown as “Good” and you will no longer be at risk of malware that targets out-dated software. If you have avast! Premier, you can select the option for updates to be downloaded and installed automatically whenever a new update is detected, which is even more convenient. Power users may not want to use the Software Updater feature. In that case, you can opt to turn it off when you do a Custom Installation of avast! 8. Thanks for your question. If you want a question answered, write us on Facebook, Google+ or Twitter.